The GoGrocer introduces a new standard for the grocery shopping experience. It eliminates the hassles inherent in the pejoratively infamous “Granny Cart”. This project was in collaboration with two fellow designers, Mark Scafini and Kuzey Taran. We were assigned to study rituals and routines that exist in the current age and discover issues that we could implement the design process. The concept of the GoGrocer emerged from our thorough research into the grocery shopping routine. We performed the research at over five commercial grocery stores in the Philadelphia, PA area. Initially, there was no focus, rather, attention was given to the entire experience, entry to exit. The problems arose while observing the habits of shoppers as they chose products. We noticed roughly one out of six shoppers brought their own cart, a pliable metal cage on flimsy plastic wheels. Surprisingly, these customers would not use the cart until after they checked out. The cart would merely act as added weight while they shopped. We recognized some people would put the store’s baskets on top of their cart, while others would put their entire cart in the store’s cart. 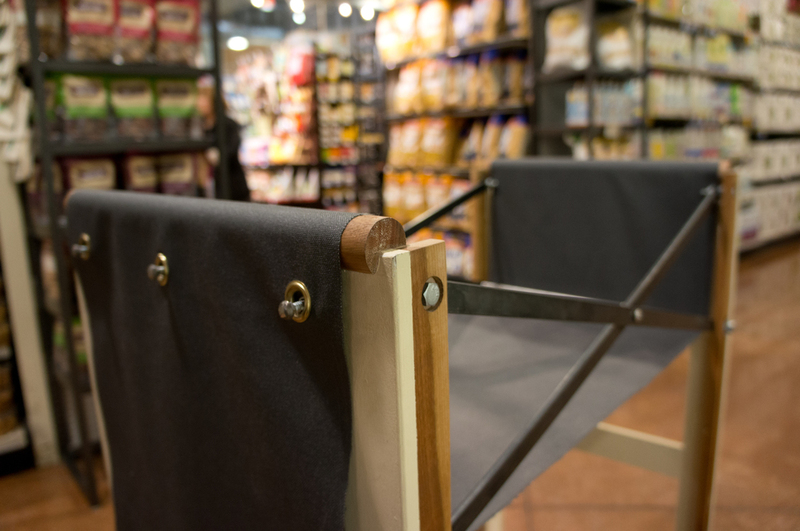 Personal carts found to be put in the gap between the handle and the cage of the store cart. Some people dragged their personal carts along, separate from the store shopping cart or basket. To allow easier access, people would place the store's basket on top of their personal cart. We even found people putting their personal cart in the cage of the store's cart, taking up space for their groceries. Upon interviewing the shoppers, we learned their reasoning for not using the cart they brought with them. 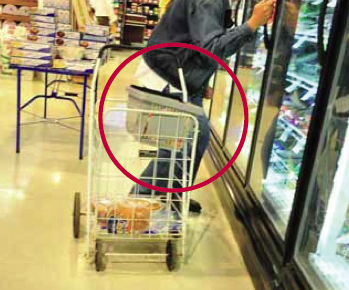 An elderly man, who put a basket on top of the cart, said that it was a height issue, and the basket provided easier placement and access of his items. Having the items closer to hip height, the man saved strain on his back. A middle aged woman we approached, cart inside the store’s cart, told us that her cart would leave her placing heavy objects on top of softer products, compromising them. She used the store’s cart because it provided space for her to spread items out as she went along, keeping items from becoming damaged. Numerous interviews proved the issue of height and orientation of usable space. 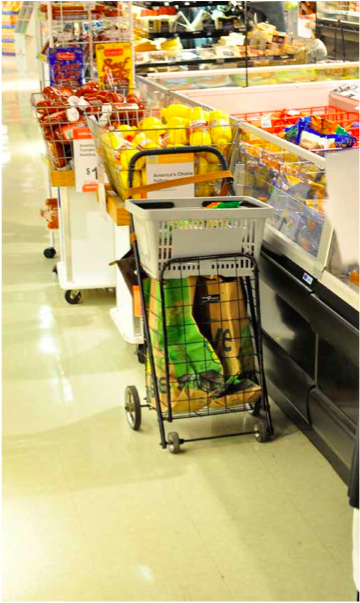 Complimenting our primary research, we investigated existing designs of other grocery carts and similar devices. We studied smaller carts, bi level carts, utility carts, and even baby carriers. We gave specific attention to the cart done by IDEO, an American design firm with a human centered approach. They are a well respected firm in the design world and their cart/ process brought them attention on ABC Nightline. Although their design was effective and addressed issues for the consumer using a cart from the store, our approach had a different angle and set of problems. The data acquired during our research allowed us to begin our informed ideation process. We converted our findings into sketches to understand how each of our minds envisioned the solution. A standard grocery cart, alongside the consumer “granny cart”, was kept at our side to analyze and feel where ideas could exist. We began hacking the two with additions such as folding shelves, weight sensitive shelves, and dividers. We further manipulated the two by cutting and changing their dimensions and how they were oriented to the user. Our goal was to combine the best elements of each, and add the solutions neither provided. We wanted a cart that the consumer used throughout their shopping experience. After countless hacks and customizing, we began prototyping scaled models of our solutions. We wanted the cart to be fully collapsible, like the original “granny cart”. This allows the consumer to easily store the cart in their vehicle during transit, as well as tucked away in a tight space at home. While creating a collapsible model and studying other collapsing devices such as an ironing board, we discovered an opportunity to have multiple lengths of expansion. This allowed us to achieve both the compact size of the consumer’s cart at mid collapse, as well as the accessible height of the store cart when fully expanded. This eliminates the issue of over-shopping with the store cart, then not being able to fit the items into the personal cart. All contents would seamlessly fit from the fully open shopping phase to the half collapse for transportation home. We worked with various materials and methods to provide these phases of shopping. A rigid material was the obvious choice to provide stability for the contents. After attempting many configurations for a solid material to fluidly change with each level, we realized it created more room for error and was the wrong direction. We then started using fabrics, primarily synthetic to avoid the stretching characteristic of cotton based material. This provided smooth transitions between the phases of the cart, as well as the possibility for easy pattern and color customization. One of the scaled functioning models. Although we found one solution, another problem arose. The cart was susceptible to elements on its sides. To counter this, we realized an issue outside of the standard grocery shopping trip, the controversy of plastic bags. In April of 2007, City Operations and Neighborhood Services of San Francisco, adopted a ban on plastic bags due to the countless harm it creates to the earth, as well as immediate effect on local neighborhoods where plastic bags tumble and fly like a weed of the city. Many other cities are considering regulations on plastic bags as well. With a trend to implement more reusable bags, and certain grocery stores awarding a discount for personal bags, we felt the encouragement of this was more than fitting. The reusable bags placed in the cart act as the storage space, containment, and division of product. Illustration demonstrating the three stages of the cart, fully collapsed, shopping, and en route home. The final iteration and full size model of the cart brought the entire process together. We tested it at the grocery store where it expanded to its fully open shopping position. While maneuvering in and out of shoppers, carts, stands and aisles, a set of four casters made this an effortless task. Having a set of bags lining the top of the cart kept items where they belonged, keeping things cold, dry, and intact. At the checkout counter, the cart’s contents were placed on the belt and rung up, while the cart transitioned to its half compacted form. Once the items were returned to their reusable bags and placed in the cart, the commute home through congested sidewalks was just as fluid as the store. Once at the residence, the items were emptied and the cart collapsed to be placed along the wall of the kitchen pantry. A set of grommets hold the cart at its intended phase.